William Daves, co-author of the Institute for Public Policy Research report, A Digital Manifesto for Britain, explains how the UK government should have a clear sense of purpose when promoting the use of technology. Digital technology and public policy move at very different paces. Developments in technology and new media are so rapid that they are constantly news-worthy. Government departments, on the other hand, confront age-old problems, of improving public services, beating crime and looking after the economy. Those of us whose job it is to channel the capabilities of digital technology towards public policy goals have to find a way of balancing between the whirlwind of technological innovation and the slower-moving world of government policy. Governments around the world have suffered from getting over-excited by the arrival of new technologies. It is now five years since the dotcom bubble burst, and businesses have learnt to be a lot more cautious before investing in new systems and equipment. Although the public sector can have no equivalent of a stock market crash, the same realisation is finally being reached: just because a system is newer, faster, and shinier than its predecessor, this does not mean that it will single-handedly deliver the desired outcomes. Which brings us to the real question. What are the desired outcomes of technological investment by government departments? It was a desire to get to the bottom of this question that led my colleagues and I at the Institute for Public Policy Research to run a year-long project, entitled A Manifesto for a Digital Britain. In the years that followed the dotcom boom, it seemed that government was often spending money on technology purely for the sake of it. 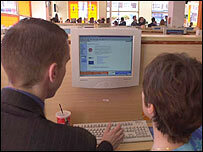 A target was set in 2000, for example, that all public services should be online by the end of 2005, regardless of whether this was beneficial or not. Thursday sees the publication of our final report, Modernising with Purpose. In it, we lay out a three-pronged strategy, to give greater clarity and direction to the way in which policy-makers and politicians understand the opportunities raised by digital technologies. Firstly, there is the critical need to ensure that our infrastructure and skills are as advanced as possible, to ensure that we reap the economic benefits of technological progress. This has often been the underlying driver of the government's modernisation strategies, but the evidence for doing has often been left woefully under-explored. Our report attempts to collect as many facts and figures as are available, to assess the economic benefits that accrue to information technology investment. Secondly, the government needs to ensure that its constitutional and legal processes are constantly adapting and coping with the digital age. We argue that as technological connectivity and complexity grows, it is up to policy-makers and politicians to define the legal limits on this, for the benefit of our privacy and security. It is perilous to embrace technological innovation without reservation, as new technologies offer new risks as well as new opportunities. Finally, there is the need to recognise the changing nature of communities and civic associations in our society. The internet has enabled new types of political engagement, many of which may not pull in the same direction as the conventional democratic structures that politicians are used to. But it will be to the benefit of our democracy if we can find ways of appreciating this fact, and communicating with these new networks. These objectives are quite simple, which is how it should be. There is a real danger that politicians are either over-awed by technology or afraid of it, because the technologists are speaking a different language from them. With any luck, this Manifesto for a Digital Britain will provide an accessible, comprehensive explanation of how the government can both exploit and respond to the digital age.